Besides reinforcing tons of fun stereotypes about French dudes, this is a neat little intro video for the Newton. I haven’t spoken Français since college, so I didn’t catch a lot of it – but the gist is there. Posted by davelawrence8 at 5:55 am on April 19th, 2010. No comments... » Categories: newton history. Tags: apple, bloc-notes, francais, france, french, messagepad, newton, video, wired, youtube. Subscribe via RSS. “Is no vivtiee for which you stand out. Posted by davelawrence8 at 11:49 am on February 19th, 2008. 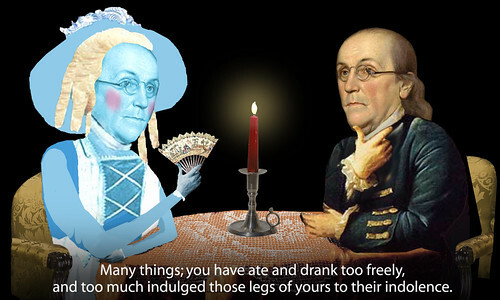 No comments... » Categories: franklin. Tags: age, americana, ben, ben franklin, benjamin franklin, brillon, france, franklin, french, gout, goutte, life, madame, revolution, sage. Subscribe via RSS.